Harley Quinn Crazy Coaster Completes Trackwork. 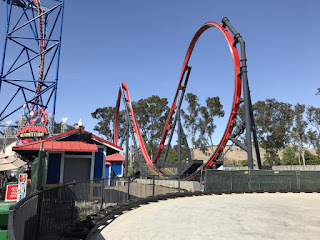 It's been a while since an update on the Harley Quinn Crazy Coaster at Six Flags Discovery Kingdom, not to be confused with the family coaster with a similar name at Six Flags Great Adventure. And we're happy to report that reddit user bdavis27 has posted a picture of the track completed. The roller coaster has a length of just 362 feet, but the two trains travel in unison at 35mph around the length of the track multiple times. The Skywarp model is by Skyline attractions, which also has plans for many other layouts that can be seen on their website.